Because this community rocks and the people have been so helpfull I can't help to do something back. This thread is for posting my progress as an absolute beginner into the world of lunetta's, for beginner info I suggest starting here: http://electro-music.com/forum/topic-40243.html Im hoping that by showing other beginners my progress I can inspire them to build their own. I am a fine arts student with a background in mechanics and a passion for music and tinkering. After messing around with computers and midi stuff I decided It's time to make my own sounds. I've done some circuitbending and built the Weird Sound Generator by ray wilson, link:http://www.musicfromouterspace.com/analogsynth/YOUR_FIRST_SYNTH/WSG_Reborn/WEIRDSOUNDGENERATORREBORN.php perfect for beginners. After a lot of searching and the usual lurking in the shadows of the forum I discovered this thing they call lunetta's. Looked around, loved it and ordered my first set of cmos IC's and other small parts. I want to avoid using expensive frontplate parts and decided I want to build a modular lunetta using droffset/electri-fire's perfboard design: http://electro-music.com/forum/topic-30479-150.html, and it just looks really cool . I built my first module yesterday. It's a quad oscilator using a 40106 based on the attached pdf, really basic but absolutely neccesary for further experiments. I found it really usefull to breadboard the whole thing first and double check everything before making the final perfboard version. Learning how to breadboard a schematic is a must have skill for lunetta building, start out easy and you'll get the hang of it in notime. I've attached a top and bottom view of the module. I know my solderingskills are a little shabby, but I hope it's usefull to others to see how the connections are layed out. Today I messed around with a r2r ladder and a tl074 op-amp, copying the other part of the quadosc schematic, see attachment. It worked real nice, but im going to try some other mixer/amp combinations to see wich works best. Suggestions about this are very welcome because im getting a little confused with all the different op-amp schematics. -finishing the mixer and amp. p.s. : English is not my native language so im sorry of some stuff is hard to read. I'm not a newbie but i am when it comes to lunettas. I've opened up a you tube chanel of my exploits. Stuff will be added as regular as possible. Fun isn't it. Tjookum - your soldering looks absolutely fine for early in your experiences! It's nice and clean and most of your solder points have a nice shine to them! It's hard to be neat and tidy sometimes on perfboard. In those regards - great job! I AM minorly envious of the 3 of you, using the hookup format that you all are. I still do prefer banana jacks / plugs, but ... so little space is required for your method. Also - I would absutively (modified word, by myself ) LOVE to find out WHERE you got those breadboard patching wires! I am down-right-tootin'-n-all in LOVE with those patch wires! Where did they come from? I MUST get some! ]Also - I would absutively (modified word, by myself ) LOVE to find out WHERE you got those breadboard patching wires! I am down-right-tootin'-n-all in LOVE with those patch wires! Where did they come from? I MUST get some! Also, I'm a beginner too, so I'll try and post some of my exploits as well. Those jumper wires are pretty good. Nice soldering! Nothing to be worried about there - or for that matter, your language skills...nearly perfect! Great idea to run this thread - have a blast - these things are way fun. I am down-right-tootin'-n-all in LOVE with those patch wires! Where did they come from? I MUST get some! very cool Adambee, that's the dirtiest sound I've heard in some time! I see you use ramp and saw waves, might have to look into that. Any suggestions on where to start? hehe, yeah they work just fine. I got them when I was experimenting with the arduino wich uses the same female headers. My breadboard is still small and so are my experiments, but im going to need a lot more wires when the module is finished. A slimmer version could be very usefull cause they tend to bend when there are too many in a row. ok, made some progress today, im glad I have some spare time cause the learning and building combined eats up a lot of time. 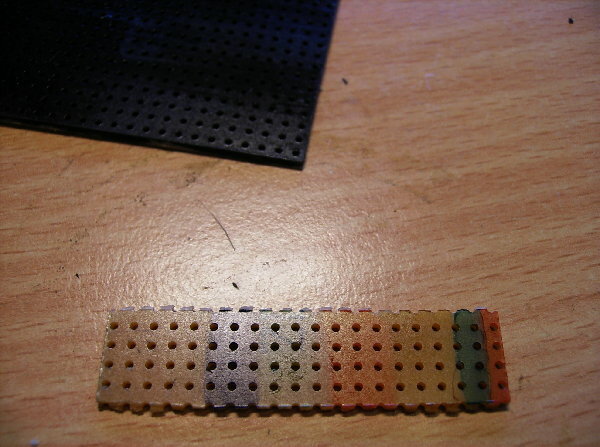 Im using euro-size 100x160mm perfboards and I considder the first one as a prototype to test stuff and see how it works. I painted the perfboard using a marker and it worked really well. I tried paint earlier but that just cloggs up the holes. I first tried a couple of cheap colourmarkers but found out that the only way to get some real coverage was to use one of those thick graffiti markers. Im interested to see how I can use this to improve functionaility as well as looks. 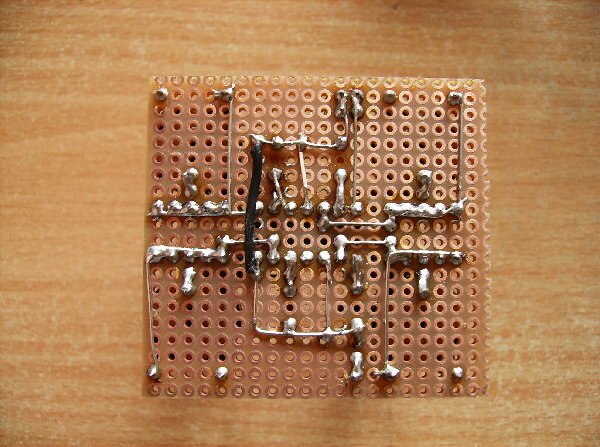 I also got the first chip on the board, a simple and very usefull 4040 divider. I used the Echuck schematics electri-fire posted here: http://electro-music.com/forum/topic-38634.html. Although the 4040 is easily understood from just the datasheet. I tried some different layouts by just hanging the parts in the perfboard to see wich works best. I would like to make it as easy as possible to use, not just by me but also some musically gifted friends. I ended up with using exactly the same design as droffset, I hope it's not considdered stealing but it was so well thought out that I couldn't find any better way of doing it. Nice perf work man. Top job. Like the way this going to look. Did you use a black marker pen for the topside of board. 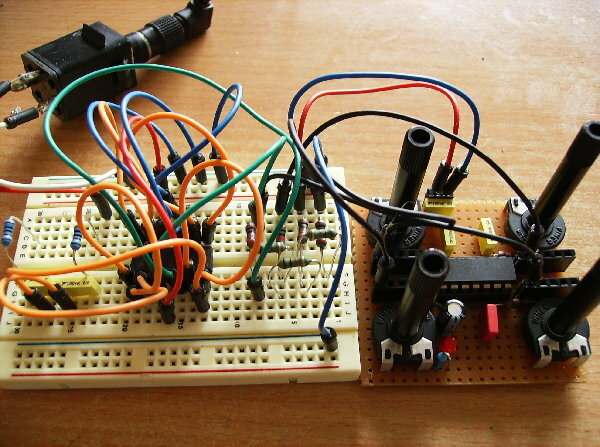 The dirt sound comes from putting upto 8volts into the gate of the Envelope/VCA. Usually 0 to 5v is gate signal but this has given it the buzz saw sound. Especially if you raise the attack and have release nearly full up. The whole setup runs on 9v so i can push the lm358 a bit harder. I have eq'ed the output to add more bass but the distortion is still there. The black marker on the perfboard looks absolutely stunning! 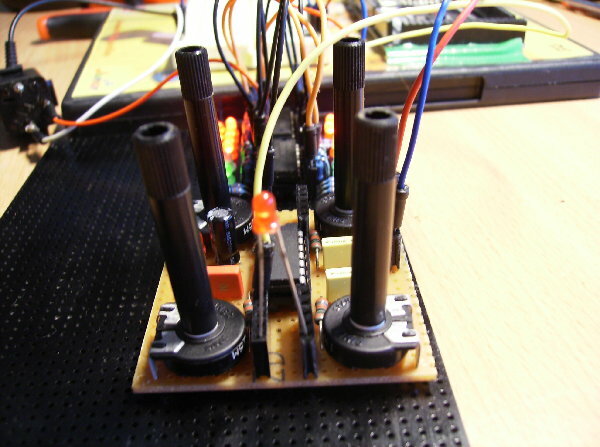 You havn't mentioned using shift registers yet. I have a 4021, but on hindsight I think I'd recommend 4015 first. And erm.. I've been rereading old posts at this forum and found too numerous great suggestions to mention here. There's already a vast amount of knowledge gathered here. Thanks all for your contributions. Hey we all share here. We all give each other ideas that's what makes this the best forum around. Keep doing what your doing because looks like your a natural. I made some pretty good progress on an incredibly simple mixer. I'm currently in a country where my mixer isn't, but once we're reunited I'll do a little walkthrough here. After all, mixing and outputs are half the battle! NOT stealing, all of the info is free. I'm happy you think it might be useful. Your soldering looks WAY better than mine did when I started. adambee7: I'll check out the Youtube Channel. I love youtube. Ajax: I never realized that I needed a mixer until I built one. As you guys come up with your own ideas and solutions, if you'd like to add some stuff to the document please let me know. I'm currently too hectic to do much work to it. Thanks, although anything in macro setting and nice light always looks really impressive to me . I used one of those graffiti markers, but anything wich can lay down a solid layer will work, might try some monoprints in the future. Thanks for explaining where the dirt comes from . I think I need to do some research on envelope filters first cause it isn't making much sense to me right now. How did you build your output module? Can't seem to decide on a good single supply design for mine. Once again, my lay-out was mostly inspired by droffset but Im curious to see how yours turns out. I don't think I got the best range out of them so messing with the values might be a good idea. Yeah those little trimpots are great, I got mine here: http://www.dickbest.nl/webshop/forums.html?act=viewProd&productId=702(dutch dealer). For 35 ct a piece it's a bargain. Im not sure if it's the squarewave nature or the pots themselve but I am getting a very logaritmic response. It makes for fiddly adjusting so I might have to change them. Is there a easy way to tell if they are linear or logaritmic? Checked out a few and got all excited so went to the shop and got myself 3 4015 and also 2 4018. This will keep me busy for some hours, thanks! very true indeed. I got a gazilion sounds from my 3 little chips already, so no shortage on that. Soundquality is a different story, I would love to experiment some more with mixers, filters, amps and effects. I for one will be waiting for your walkthrough. NOT stealing, all of the info is free. Smile I'm happy you think it might be useful. Usefull? I am a visual kind of person and by just seeing your module I learned a lot! I tried making mine a little different but yours are just to well engineered to change anything about. Im still struggeling to get the powersupply working as it should. The arduino has 5v and 3v3 outs, does this mean I can use the 3v3 as a dual supply? I know an arduino is overkill in a lunetta but since I have it I might as well use it. Im also running into some problems routing all the different +v and ground connections underneath. How do I place the bypass cap when I use one +v and ground connection for the entire board? How did you tackle this droffset? And some more pictures, yay! Thats sick man. That is coming along fast more vids please. thanks adambee. Ill try to post some more vids later when I finish some more modules. @ryk: If you dont mind I would like to reply to your comment on youtube here. For such an early construction, this is just phenomenal! A great grungy sound as well! From overdrive into the camera's mic, or is it naturally like that out of the boards? Looking way forward to more as you continue learning! Thanks for the kind words . I didn't use any overdrive or any filter/mixer, I recorded it using the camera mic wich sounds pretty much the same as real life. 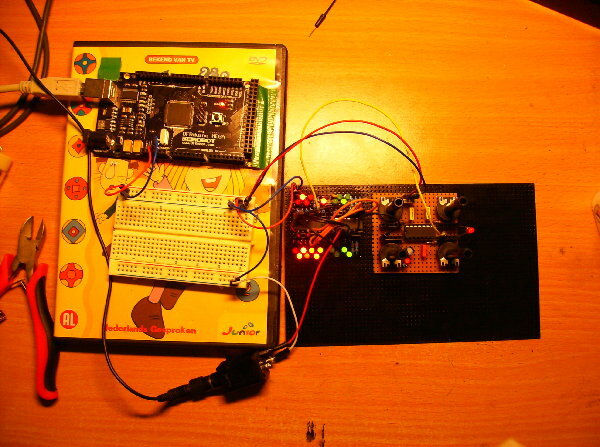 I used 5v arduino supply, a 3€ usb amp, the quadosc, 1 4040 and 1 4051. That's what I love about lunetta's, there is no "wrong". I literally just plug anything into everything and the leds start flashing and the sound pumping. There is a lot of information on the forum already and some of it looks quite daunting. I think it's important to lunetta newcomers to know that it really is as easy as pumping out some squarewaves and using a couple of cmos chips and a amp to make a lunetta sound machine. 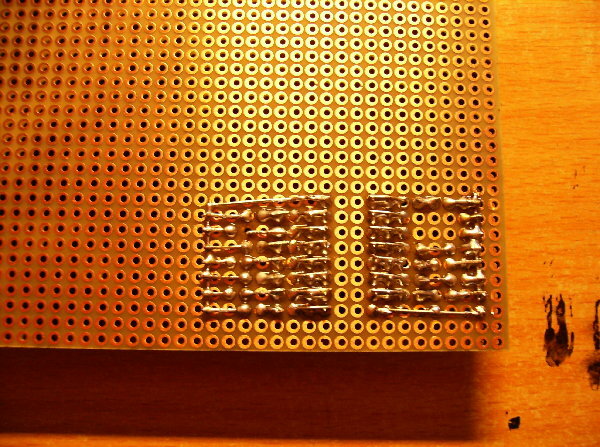 Next up will be the 4015 shift register, I'll probably breadboard and "dryboard" it first cause I've never used one. Whu'! Excellent sound! Just wonderful distored RAW! Exactly! Fun for the whole family! 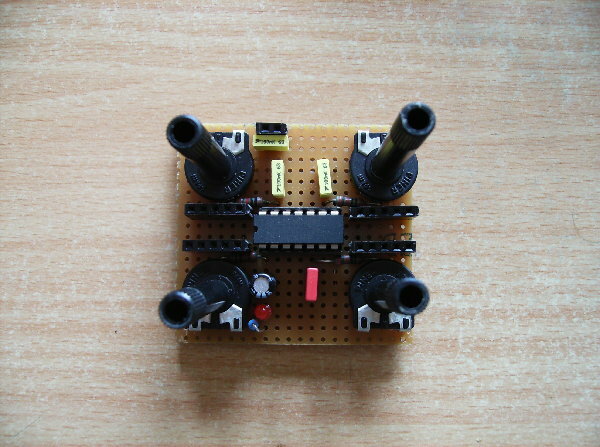 For the Shift Registers, if you're not using their individual outputs for driving other things and would like to see / hear some action, build yourself an R-2R Digital to Analog Converter (DAC). Then, pump the DAC's output into a VCO. The more inputs that you have, the greater the variety of (cough cough) 'melodies' that you'll get out of it. 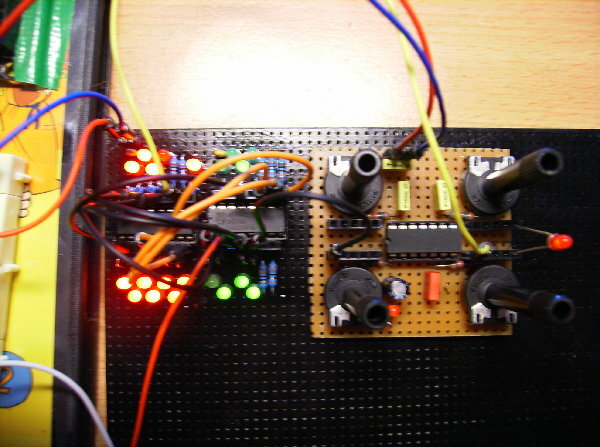 A Shift Register (with 8 bits) into an R-2R, running along side a 4017 / 4051 Synthmonger Melody Generator? Just terror! Love it. Oooo. Find videos from Bruce (RFeng). Some of the most amazing stuff has come out of his machines. I got the 4015 in yesterday, I really wanted a more symmetrical lay-out so I wired pin 1 and 2 to output 9 and 10 and vice versa. It's a usefull addition to the board and the leds make really cool patterns too . Im planning on using the vco mod for my wsg so I might get some more fun out of this setup. Im still confused about the use of bypass caps, at the moment I don't use them for the 4051 and 4015 and they seem to work normal. On the wsg I just put all the bypasscaps next to the power and ground supply, I remember someone saying that it's good enough for these simple circuits and it works just fine. Power is also something im struggeling with. 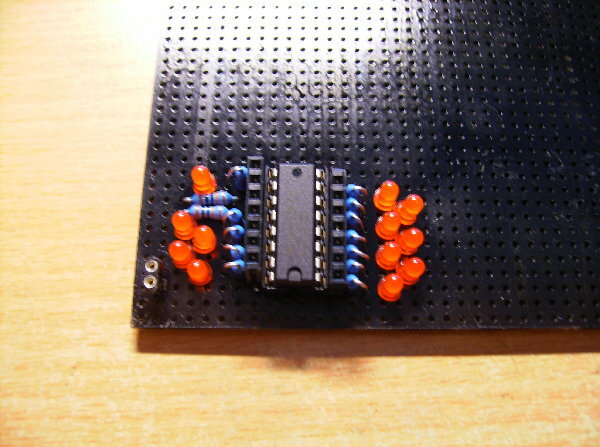 Im planning on building a seperate board for the mixer and other op-amp related stuff powered by a 2x9v bipolar supply. Can I connect the ground of the 2 boards together and still have the cmos board on single(5-15v) supply? Also tried a 4011 ringmod today, at 5v it didn't work at all and at 9v it would only spit out some fragmented sound at high frequency's. Anyone have a good schematic for this? p.s. : It says I've reached my maximum upload (20mb) already, any good reliable way of getting more pictures up? Im still confused about the use of bypass caps, at the moment I don't use them for the 4051 and 4015 and they seem to work normal.On the wsg I just put all the bypasscaps next to the power and ground supply, I remember someone saying that it's good enough for these simple circuits and it works just fine. The bypass caps are of special importance at you basic oscillator chips where you have your timing capacitors and resistors. In a lot of Lunetta's this means at your 40106 IC's. Voltage drops or oscillations on the powerline directly affect these. I "think" this is less of an issue with IC's that just take in external clocks, like your 4051 and 4015's. Putting multiple bypass caps near the main power sort of defeats the purpose. Might as well just have one bigger electrolitic there. The small (usually 0.1uF) caps want to go as close to the IC as possible. Question: I've seen resistors used in schematics as low as 220 ohm used, but more often higher ones like 220K's (that's what I used). I presume low value resistors increase battery drain. Is this of practical significance? Is there a limit to how high one should use? Any "generic" recommendations? Hrmpff, that should not be the case. I think you should either troubleshoot your connections, or use all stabilizing techniques like bypass caps and pullup/down resistors. It says I've reached my maximum upload (20mb) already, any good reliable way of getting more pictures up? Ask the moderator to increase your upload limit. Erm... moderator, please? I'd like to see more "tjookum" stuff. Here's an example of running a TL084 on a single supply voltage. The VR (reference voltage) of 4.5V is made with two 100k resistors (lower right corner of the schematic). Also note the use of the capacitor used there. It is not always used. I've seen other value caps in schem's too, value seems not to be too critical. Small values like Pete used filter out oscillations on the powerline, larger ones help stabilize the voltage. I don't have a cap there, and it works. aha! This made it all totally clear for me, thanks! Im going to use some leggs under the perfboard so i can squeeze some in on the underside if i need them. I think I saw one of those dronelabs somewhere before, good stuff. Seeing the schematic made it totally clear to me, thanks. I happen to have a TL084 I just bought so I think Ill make good use of it and try the lowpass, fuzz and maybe even the bandpass filter. Do you have any samples of the sounds yours makes? That sounded just great! Almost from the start though, I kept expecting some poor person to say "Hello? Heeeelloooooooooo? What's wrong with this phone? Why wont it answer whoever's calling? Hello???" (on the Dronelab): Do you have any samples of the sounds yours makes? I didn't build one, I came across the link in another recent thread, and used the schematic to illustrate the use of applying VR (= 0.5 +V) to the oposit opamp input for opamps that normally need bipolar power.